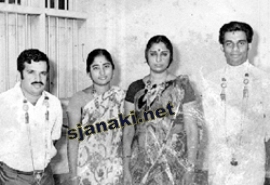 Jayachandran + S Janaki + Ilayaraja = Melody . This was the formula and it was proved repeatedly , Jayachandran and Janaki both had very melodious voice and beautiful modulation and they made sure that every song they sang together will be an all time classic. They sang equally melodious songs to MS Viswanthan , G K Venkatesh , Shanker Ganesh , Gangai Amaran also along with Ilayaraja. Enjoy these classics and stay tuned for more !! !